Being able to run two or more UPS in parallel allows power protection consultants to provide either greater capacity planning and/or a degree of resilience. The latter is known as parallel-redundancy and is the heart of the modular UPS systems in operation today inside complex datacentres and comms rooms running critical power infrastructures. Traditionally UPS systems were run as standalone machines. The static switch built into their on-line double conversion designs provided these systems with the ability to fail safely to mains without dropping the load. The issue then became one of running the load on a raw, unfiltered and therefore unprotected mains power or even generator supply. Paralleling two or more UPS together provides the ability to power critical loads using N+X configurations; where X denotes the number of spare UPS systems (also referred to as UPS modules). The approach allows three phase UPS systems to reach larger MVA rated outputs. For example, two Riello Master 500kVA UPS systems could be operated as a capacity system up to 1MVA or in an N+1 500kVA configuration. The approach is also used within modular systems such as the Eaton 93PM UPS. N+1 provides one spare UPS module, N+2 two spare modules and so on. Two 40kVA modules in an N+1 configuration would give a 40kVA UPS system with a second 40kVA module available to support the load in case of the primary module failing or being powered down (through a breaker switch) for service. 2N would denote two complete systems providing an A and B supply through some form of output synchroniser and/or static switch to power the load. It should be noted that parallel redundant UPS systems are required to meet the Tier requirements defined by the Uptime Institute. In an N+X configuration parallel-redundant UPS system, if one of the UPS modules fails or is powered down for service, the spare module is brought instantaneously into a load sharing capacity to support the load. At no time is the UPS load exposed through the automatic bypass to the raw mains supply. Paralleling UPS outputs requires sophisticated control systems. Not only must the UPS output waveforms be controlled but they must be synchronised into one unique output supply, with the entire UPS system able to remain stable during sudden load changes and potential power problems upstream of the UPS. Parallel capacity UPS systems have no redundancy when operated at full load. Two 40kVA UPS modules could be connected into parallel to give an 80kVA capacity uninterruptible power supply system. Parallel capacity uninterruptible power supplies only provide resilience up to the spare capacity within the system for say overloads. Only their overall built-in automatic bypass switches provides resilience for a potential system failure. Within a parallel redundant UPS configuration one UPS module is identified as the master UPS and the remaining modules as slaves. With such a configuration all the modules are connected within a control loop and the slaves take their information and lead from the master module. If the master module fails or is disconnected, another slave automatically takes of the master UPS module role. Within the system energy can be saved by allowing (a) one or more of the slave modules to power down (reduced power) into a sleep mode and/or (b) putting modules into an energy saving Eco-Mode (line interactive or standby). Whilst each UPS module will have its own internal automatic bypass (static switch) an centralised wrap-around bypass with Castell interlock may also be considered for additional resilience and control of the parallel redundant UPS system. In modular UPS systems the same technology applies but instead of standalone UPS systems, modular trays are used and the cabinet into which they are installed also houses the necessary connections and bypass arrangements. 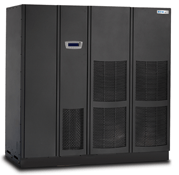 A typical modular UPS system may hold up to four modules. If a greater size is required two or more cabinets, each with the correct number of UPS modules may be connected in parallel.